Your home’s heating system is crucial during the winter season. Not only does it maintain your desired comfort levels but it also protects you from the life threatening, freezing temperatures common in certain parts of the country. To ensure the safety of you and your family, it is beneficial to understand the type of heating system you have, safe operating procedures and the necessary repairs to keep it functioning properly. Although furnaces and boilers are by far the most common methods used to provide heat to households in the U.S., this article will touch on some other methods homeowners use to heat their residences as well. It’s always smart to get price quotes from at least four pre screened and licensed HVAC repair & installation contractors before starting your project in order to get the best price. Forced air systems are those that use air to distribute the heat throughout the building. The system uses a series of ducts to carry the heated air to vents placed in individual rooms or other areas of your home. A thermostat activates or deactivates the system to maintain a desired, preset temperature. If the temperature drops below the setting, the thermostat activates the system until reaching the temperature, at which point it deactivates the system. The difference between most forced air delivery systems is the method used to heat the air. The most common types are gas or electric furnaces, heat pumps and central air conditioning systems utilizing electrical resistance heating elements. Easily replace old or worn systems by utilizing existing ductwork. Provides fast, efficient heating at the touch of a button. Maintains even heating throughout the home. Maintains air quality by filtering the air before it is distributed throughout the home. Requires periodic maintenance to maintain efficiency and performance. Replacing filters and periodic duct cleaning are required to prevent the distribution of dust and debris throughout the home. Produces more noise when compared to radiant heating systems. A boiler generates hot water or steam to power baseboard, radiant or radiator heating. Today’s newer models are very different from their cumbersome predecessors. Small, compact and energy efficient versions are available that offer low maintenance and no drop off when it comes to performance. Natural gas, propane, oil and electricity are types of fuels used by boiler systems to convert water into steam. Old, inefficient boilers or coal burners that were switched or retrofitted to burn oil or gas are likely candidates for upgrading to a new, high-efficiency boiler. High-efficiency boilers use a direct vent system, which means their exhaust gas and combustion air circulate through the wall to the outside, eliminating chimney requirements. The combustion chamber of newer systems is sealed, preventing any exhaust or gases from entering your home. Replacing or installing a new boiler can be expensive. As with older boilers, maintenance costs for new systems are typically high. Retrofitting a new boiler to an old system can be difficult as problems with pipe size and water flow can limit its efficiency. A newer system gaining in popularity and used to generate heat more efficiently is an in-floor or underfloor heating system. These systems are often powered by steam, oil, gas, electric and even solar. The system involves a series of tubes or cables placed under the finished flooring. Cost effective when used in new construction or renovations. Uses less energy than traditional systems. Initial warm up takes longer than traditional heating systems. Finished flooring must be compatible with in-floor systems. Installation can be expensive depending on the type of structure, construction and renovation methods. An older method of heating with steam uses a radiator and boiler system. Usually found in older homes and apartment buildings, the cast iron radiators are powered by steam to heat an area. The radiators connect with either a one-pipe or a two-pipe system, which carries the steam and condensate to and from the boiler. The boiler converts the water and condensate into steam, which in turn travels to and heats the radiator to provide the heat. Less moving parts make them extremely reliable and durable. Can be upgraded with new and smaller convection or wall panel units. Radiators are not very attractive. They take up valuable living space and hinder furniture placement. The aforementioned heating systems produce adequate heat and comfort levels to ensure you stay warm during the winter months. However, like most other types of equipment, they can malfunction. You should always hire licensed and insured contractors experienced with the type of heating system in your home to perform maintenance or repairs. Before choosing a heating and air conditioning contractor, you would be wise to ask for references and check with the BBB “Better Business Bureau” for any complaints or concerns. With that being said, there are several maintenance procedures capable homeowners can perform to extend the life of their equipment and maintain its optimum efficiency. For safety reasons, before performing the recommended procedures, verify that the power or gas to the system is off. Inspect the flue pipe for visible cracks, holes or leaks. A leaking flue pipe can introduce dangerous carbon monoxide into your home. Clean register and return vents. 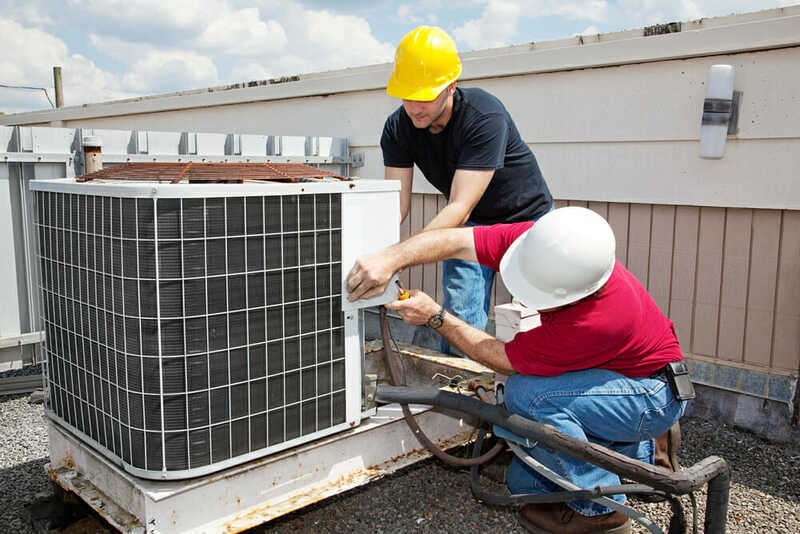 Schedule annual maintenance with your heating and air conditioning contractor. Heat pumps and central air conditioning systems incorporate a filter or filter system to prevent dirt and other debris from contaminating the evaporator coils. Changing the filter regularly helps to maintain a clean evaporator coil and allows the air to flow easily. A dirty coil with a restricted airflow can cause your system to work harder to distribute the conditioned air, leading to higher energy use, energy costs and shorten the expected life span of the system. Clean the evaporator coils. Although this project is more labor intensive than changing a filter, it is not that hard. Liquid coil cleaning solutions are available at most home improvement centers and air conditioning supply houses. Spray the coils with the cleaner and allow it to soak in for a few minutes before rinsing with clean water. It is important to follow the manufacturer’s instructions and warnings posted on the label. You should also wear protective gear such as gloves and eye goggles during coil cleaning. Remove the air handler — inside unit — cover and oil the fan motor. It takes just a few drops of applicable grade oil to lubricate the motor, which helps to keep it running efficiently and possibly extend its life. Oil the condenser/compressor — outside unit — fan motors on heat pump and central air conditioning systems. Keep area immediately around the condensing unit clean and free of weeds, grass and other debris. Periodically rinse condensing coils with clean water. Clean return and air vent registers throughout your home to help eliminate dust, dirt and debris from circulating back into your system. Replacing or installing a new heating system in your home is a major undertaking requiring careful thought and consideration before the project begins. Taking the time to plan and size the project accordingly not only can save you money but also help the project to run smoothly without delays. Take into account the following considerations before replacing or purchasing a new system. You get what you pay for. Sometimes the lowest price does not provide the best option. On the surface, it might seem like a good value, but often a cheaper price translates into inferior equipment and/or workmanship. High-efficiency equipment can actually pay for itself over time by reducing energy costs. Don’t forget the rebates. States, manufacturers, power companies and even the federal government offer rebates for high-efficiency systems. This can significantly reduce the amount of your out-of-pocket expense when replacing or purchasing a new system. Pay attention to SEER ratings. SEER “seasonal energy efficiency ratio” rates the efficiency of the system. A higher SEER rating means a more efficient system, which will use less energy and save you money. Shop around. Get several estimates from reputable companies. The equipment and service will vary between contractors. Inquire about refrigerant. R-22 refrigerant has been restricted and production ceased. Although it is still available, supplies are dwindling and prices are rising. Verify that your new system uses the newest refrigerant available, R-410A. Maintain your new system. Consider purchasing a yearly maintenance contract for your new system. Annual check-ups and maintenance will keep your system running at peak performance and efficiency. Not only will this extend the life of your system, but could also eliminate expensive and preventable repairs down the road. Size is important. In most cases, replacing your old system with a newer one of the same size is fine. However, several circumstances can solicit change such as additional doors or windows, home additions and insulation. The old adage “bigger is better” does not apply when it comes to heating and air conditioning systems. Your contractor should walk your home thoroughly to ascertain any changes and measure for square footage to determine the size and type of equipment to install. Consider financing. A new heating system can be an expensive undertaking and burn through your available cash. Many contractors offer special, 0 percent financing to attract new customers. Your heating system is one of the most crucial appliances in your home. If your system is beginning to fail or needs replacing, don’t get left out in the cold. Delaying repairs, maintenance or replacement can increase your costs down the road and possibly lead to a cold winter.